Start your year with some starry wallpaper from the Monterey Bay Aquarium. A NEW YEAR... at the Monterey Bay Aquarium doesn't mean that the residents are changing up their ways, or making resolutions, or vowing to devour more mussels or scurry among rocks and coral more often. The otters and sardines and crustaceans and cephalopods and all of the other wondrous critters found at the Cannery Row destination will keep on keepin' on, as animals so magnificently do (as we humans plot and plan our next 12 months with a hefty dose of fret and fortitude). Still, a new year means new opportunities to connect with the marvel of an aquatic institution, to see what's happening in conservation and ocean research and to, yes, awww over various beasties as they twirl and dive in their environments. On the near-calendar at MBA? Those beloved Daily Shows & Feedings, like the Penguin Feeding, and the Open Sea Feeding, will rock visitors' water-loving worlds daily, as they do. Exhibits like ¡Viva Baja! Life on the Edge will continue to give we live-upon-the-land-ers a peek at coastal habitats that aren't too far away from our day-to-day. And will those epic wallpapers continue? THEY WILL, and they're free to download, and they have the lovely ability give anyone sitting in front of a screen a profound interlude with the natural world, aquatic division. 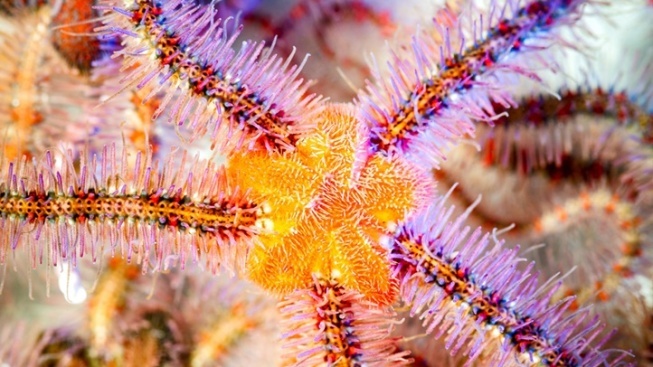 The pretty profundity as we start the year comes courtesy of downloadable wallpaper featuring a spiny brittle star, which boasts five arms that "...glow with a distinct variety of candy colors and patterns." Adding further beginning-of-the-year-ness to this particular wallpaper, consider how easily the spiny brittle star can change direction: "...it simply changes its lead arm and heads off in a new direction." Call that positive inspiration as we head into the new year. Find your free wallpaper here, and make it a daily reminder that connecting with the wider world can be done by visiting a place that keeps the wider world, and its critters, at heart. MBA, you're one such otterly amazing place.